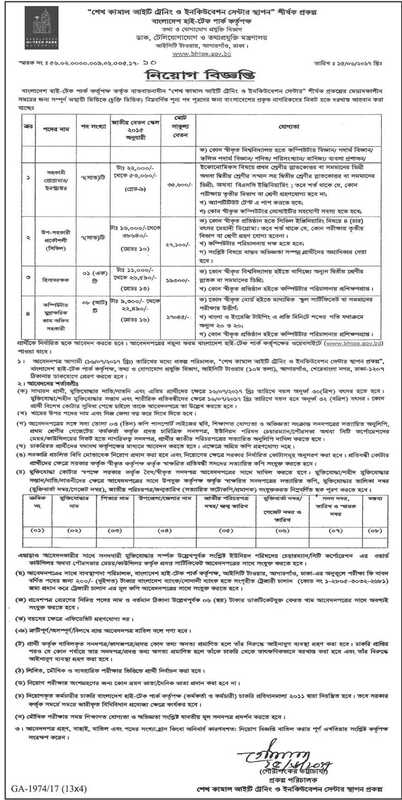 Bangladesh High-Tech Park Authority Jobs Circular 2017 has published on 15, June, 2017. BHTPA Jobs Circular 2017 also published on Prothom Alo Chakrir Khobor jobs Newspaper. The Jobs Circular 2017 has punlished on www.bhtpa.gov.bd. The interested applicant can apply by sending Application Form. An Applicant can apply within on 16 July, 2017 by Postal Order. Get more information of BHTPA Jobs Circular 2017 in https://www.ziggasa.com. Age: within 30 years & 32 years for Freedom Fighter Son/ Grandson/ Others. Salary : Minimum 22000 tk up to 55000 tk. Pay to fees Through Bangladesh Bank or Sonali Bank using by Trajary Chalan No. 1-2805-3032-2681. Attached Trajary Chalan Copy in Application Form. Send Education Certificate, Nation ID, Freedom Fighter Certificate with Application Form. Every Document must be attested by Grade Govt. officer.